Organizations often find it difficult to manage account receivables and keep the cash flow running. Companies stuck with an inefficient billing and payment system fail to bill their customers timely and hence payment is also received late which results in the account receivables piling up. Invoice personnel also sometimes struggle to handle a complicated time and billing software. Therefore, every organization needs an efficient yet simple invoice tracking software for timely invoice generation and payment from clients. AccountSight being a cloud based application can be accessed from anywhere anytime without any software or hardware requirement. All that requires is a computer with internet connection. AccountSight’s intuitive invoice tracking software helps to create beautiful online invoices within seconds of time. Invoices can be configured to adjust taxes and discounts and to personalize other settings like time period, billing items i.e. time and/or expense etc. Manual invoice is generated in order to bill the customer for some unscheduled or irregular costs that are not based upon the project time and expenses incurred. For examples, project manager can generate a manual invoice if the project requires to purchase some minor product externally or to hire some other company for small services with prior acknowledgement of the client of course. This is the most common type of invoices. These invoices are generated based on the weekly time sheets and expenses recorded by the employees during the project period. Recurring Invoices are special purpose invoices that are generated only when some specific items are used or purchased for the project at regular intervals, say, weekly or monthly. Only Administrator can generate recurring Invoices as it is created at Customer level, not at Project level. 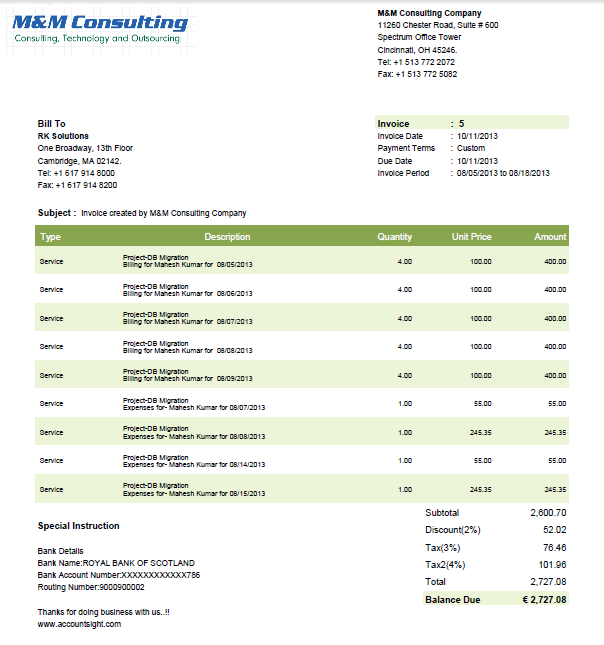 Invoices can be exported to Excel or PDF format for convenience. Also, invoices can be emailed to clients manually or automatically which is a crucial requirement for many organizations. Invoices can be marked separately once payment is done. Also payment history can be seen for all the past invoices. AccountSight invoice tracking software has a smart and flexible workflow notification alert system. The system can be configured to send notifications about payment delays. AccountSight offers a rich dashboard that gives a 360° view of the cash flow and account receivables. It provides a number of filters that help to slice and dice all invoicing data and generate consolidated reports. Many companies want to impress customers with personalized stylish invoices. 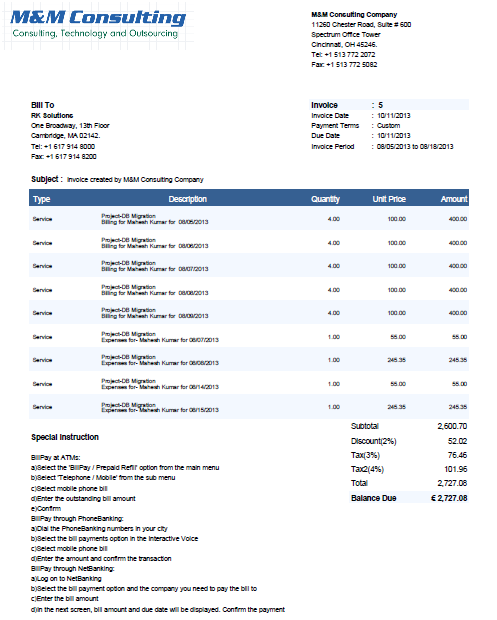 AccountSight offers beautiful colored invoices to users. Apart from the generic black and white invoice, many more color variants are available in AccountSight v2.0: to match with all types of brandings. All these varieties add to client satisfaction and convenience. Are you looking for such a smart and efficient invoice tracking software for your organization? Try AccountSight’s 30 days FREE trial before you decide to purchase. Register now! AccountSight is a fast and easy online time tracking, expense tracking and invoicing software. It is a highly useful cloud based application for small businesses, consultants and freelancers for maintaining weekly time sheets and billing online as well as for mid-size companies that require online projects management, employee timesheet & expense tracking and online invoicing capabilities. The rich functionality and hassle free user experience makes AccountSight unique.